Among this year’s gilded list of Oscar nominees, there are surely few peasants. But Emad Burnat is one. The amateur cameraman, who lives largely off the land of his modest Palestinian village, now shares a Best Documentary nomination with Israeli filmmaker Guy Davidi for 5 Broken Cameras, their illuminating and often astonishing first-person account of the ongoing Israel-Palestine territorial dispute. Cinema can be an inadequate tool to explain a conflict as old as time, but there is no major attempt here to provide historical or political context; 5 Broken Cameras is an intensely personal film. Told from Burnat’s perspective over a five year period, we watch from a unique vantage point as his native village of Bil’in boldly resists the ever-encroaching Israeli settlers and their bullish army enforcers. The film is framed through Burnat’s collection of cameras, each of which successively suffer damage at the hands of IDF soldiers during Bi’lin’s regular largely nonviolent demonstrations. Burnat can chart “an episode of my life” with each camera; as his involvement in the resistance movement becomes greater, so does the danger to his life. Burnat’s broken cameras provide a neat structural composition to the film, but a more intriguing framing device is found in his fourth son, Gibreel. Born on the same day that soldiers first arrive in the village, Burnat’s first camera is originally purchased just as any proud parent might – to document Gibreel’s formative years. Through his thoughtful narration, Burnat openly worries what it means to be born into an endless cycle of violence and oppression, or what it means when your first words are “wall” and “soldiers”. His footage, showing frequent – and sometimes fatal – tussles between both sides, is visceral and raw, yielding deeper context than any fleeting news bulletin could hope for. A voracious documentarian, Burnat trains his lens indiscriminately on the chaotic world around. The five cameras bear witness to some staggering acts of brutality from the IDF, sometimes in defiance of Israeli court decisions. Like the looming settlements, it’s an incremental process of oppression, a slow march of aggression, reaching its zenith when soldiers attempt to evict Burnat for being in a “military zone”. This being such an autobiographical tale, there is no effort to seek any response from the Israeli side, and there will be plenty who take issue with the film’s single-minded approach. But in Bi’lin’s compact example, the conflict seems yawningly lopsided, an eternal battle fought in disproportionate terms: kids with pebbles versus soldiers with semi-automatics. The filmmakers make no explicit political statement in 5 Broken Cameras, but the implicit one is loud, angry, and urgent. First-time director Seth Gordon could surely not believe his luck when stumbling upon the world of competitive video gaming. Priceless moment follows priceless moment in King of Kong, his 2007 documentary on the race to hold the world’s top score in Donkey Kong. Like many nail-biting docs, it shares DNA with sports movies. Life – and, no doubt, a talented editor – generously imitates art, following the carefully-structured blueprint of a Rocky or a Mighty Ducks (Eye Of The Tiger makes an appropriate appearance on the soundtrack), to devastating effect. Somehow, Gordon manages to render heroes and villains so gleefully black-and-white they might be dismissed as unrealistic in a fictional setting. In the protagonist corner: Steven Weibe. He’s the underdog, an outsider, an impudent challenger to a long-established throne. Helpfully for the narrative, he’s also a person of genuine integrity – a family man whose friends speak of highly, yet dogged by near-autistic obsessions (music, sports, video gaming), frequently down-on-his-luck, never quite achieving his potential, never quite being the best at anything, and, when we join him, recently laid off from his job. In other words: the prototypical embodiment of ‘the little guy’. 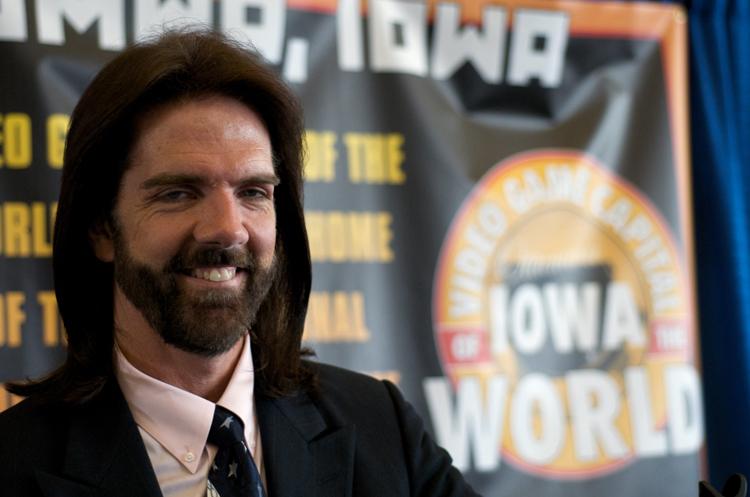 And then there’s Billy Mitchell. Riddled with Brent-isms, smug, preening and quietly manipulative, the ‘Player of the Century’ is effectively the anti-Weibe, or as Gordon described him in an interview, “the personification of evil”. His mere physical appearance provokes laughter and alarm. Sporting a meticulously trimmed beard and a fearsome mullet, he is the stock conception of a serial killer, the kind a tabloid would charge as guilty before proven. The battle lines are perfectly drawn. In just 79 minutes, Mitchell vs Weibe becomes a Liston vs Clay for the Pacman generation and we find ourselves screaming at the screen like our life’s savings are invested in the fight. King of Kong‘s charming execution and dorkish subject matter made cult status preordained from its Slamdance premiere onwards. But it is more than simplistic geek fodder – it’s a supremely well-executed piece of dramatic work, more thrilling and emotionally powerful than most scriptwritten dramas. We can but imagine what else Gordon might gone on to offer, had he not turned his back on documentaries in favour of studio comedy meh-fests like Horrible Bosses. And with that, he tragically denied the world the seminal documentary on drains it so desperately yearns.